The Big Fink® cathodic protection test station is a field proven, high strength, maintenance free terminal for monitoring electric currents and potentials. Since 1976 the Big fink® CP test station has been utilized worldwide by gas, oil, chemical and water pipeline companies. Manufactured by Cott in Pittsburgh, Pennsylvania and Los Angeles, California; it is available from Cott distributors everywhere. Due to variations in pipeline casing projects, your project engineer should determine spacing. Some pipeline companies have achieved excellent results by positioning two insulators at each end of a casing and spacing insulators 4 to 6 feet apart. 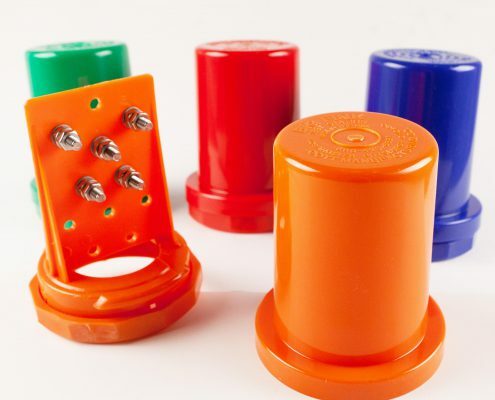 However, maximum spacing of insulators are also dependant on pipe diameter. Cap, Terminal Board and Collect Nut made from Makrolon® polycarbonate. One of the toughest plastics in the world. Standard nickel plated brass or optional stainless steel for guaranteed long service life. Up to 11 terminals accessible from both sides of the board. All BigFink® terminal boards can accommodate COTTShunts®, Slide Resistors, COTTMeters® (Volt or Amp) Burndy connectors, Cott bonding/shorting straps, Banana Jacks, ZAPGard® , locking devices, lightning arrestors and flange mounting brackets. Red, Orange, Yellow, Green, Blue, White and Black are standard on BigFink® and COTTPipe®. Any color is available as an option. COTTPipe® PE (standard) polyethylene has over 20 years of proven durability. COTTPipe® PC (optional) polycarbonate is available for the toughest applications. Standard length 6 feet, available to 40 feet. COTTPipe® PE is easily installed and prevents pullout.